I can’t believe this is my fifth and final Kentucky Derby at Southgate Coins. I started here when I was 18, having never seen a horse race in my life, let alone knowing what the Kentucky Derby was. But I never give up an opportunity to get all dolled up, and therefore KDD at Southgate turned into one my favorite traditions. Being able to see our newest team member Emily experience her first horse race—and me getting to experience my last—was exciting and sad all at the same time. It will surely be one of the many things I will miss about working here at Southgate Coins. Rusty, Marie, Maya, Emily, and I were all dressed up and ready on Saturday, May 4th, in our Derby attire, with us ladies donning pretty dresses, skirts, floral blouses, and dress pants, and Rusty in a nice suit. Of course, we all had on our decorative hats, which we received several nice comments on from customers throughout the day. Marie even gave us girls beautiful white gardenias to finish off our outfits! I (Emily) have been eagerly waiting for this day to arrive since back in October 2012, when I came in for my interview. 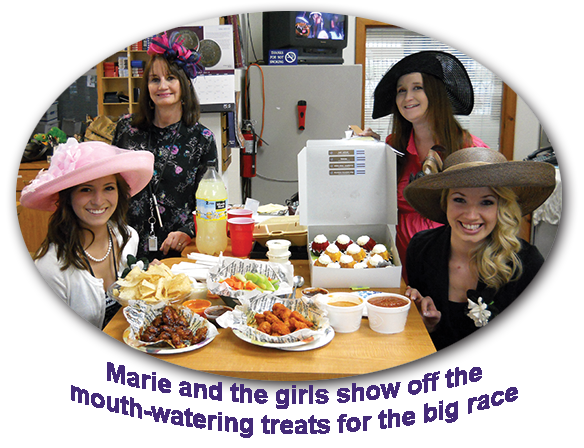 I was shown photo albums of past company events and the one that stuck out to me the most was the “one where they wear the fancy dresses and the big hats”—otherwise known as Kentucky Derby Day. I had never witnessed a horse race before, and that of course, added to my excitement. Everything from choosing a horse to bet on, to gathering around the television and cheering on your chosen “winner,” helped make the day especially memorable. Finally, after months of anticipation, the long-awaited day had arrived. I never thought a horse race could be so exciting! The day was filled with excitement, laughs, tons of pictures, and of course, cute hats. I learned that as part of the Southgate tradition, Rusty places $2 bets for each of us on a horse we choose. I ended up choosing Verrazano, and Nicole went with what she thought was a “safe bet” by picking jockey Calvin Borel (a three-time Derby winner, I later found out) atop Revolutionary. Maya chose Normandy Invasion because her due date falls on its anniversary (D-Day is June 6—Maya’s due date), and Marie chose the fan-favorite Orb. Rusty, who kept his pick secret until moments before the race, chose Oxbow. Rusty also decided he’d throw down a few bucks on Goldencents, since the horse was owned by another coin dealer. This day has already become one my favorite experiences and one of my sweetest memories at Southgate Coins. Needless to say, I had a blast on Kentucky Derby Day! Although I (Maya) don’t work on Saturdays, I worked with Rusty, Marie, and Nicole to decide upon a good-tasting menu that I could pick up for the occasion. We ended up getting boneless wings, chips and queso with salsa on the side, and veggie sticks with ranch dipping sauce. Rusty and Marie surprised us all with an assorted-flavor box of Bundtinis (mini bundt-cakes). Even though the horse race may have only lasted about two minutes, the half hour we were eating certainly filled us to the gills! Now, if you’re a fan of horse racing, you know that the slightest little thing can sway the betting crowds at Churchill Downs. This year, KDD attendees were greeted with rainy weather, which made the track “thick like peanut butter.” Well, not all of these three-year-old horses have experienced running on a wet track, so it was a toss-up as to which one would win the Run for the Roses. As the race started, we all, separately, got our hopes up that we’d have a winner. We each had our pick at or near the top of the pack for brief moments, only to sigh as they fell back into the muddy crowd. But, after rounding that last bend, there was one horse coming up fast: Orb. Orb had pretty much relaxed at the back of the pack for the first three-quarters of the race, but when his jockey requested some extra umph, he got some—and a trophy to go with it! Orb was Marie’s pick for our free $2 bet, and this marks the first time in years that one of the girls has bet a winning horse. Congratulations, Marie! Although none of the rest of us bet on the winner, we did have a pretty good placement for our bets too (certainly the best outcome for the girls’ picks that we’ve had in years): Nicole’s horse, Revolutionary, placed third, and my horse, Normandy Invasion, came in fourth. Rusty’s Oxbow came sixth, and little Emily’s Verrazano decided he’d start at post fourteen, and finish in fourteenth place. Overall, between the excitement of dressing for the occasion, picking our horses, and enjoying the food and company, we each had a great experience at Southgate’s 2013 Kentucky Derby Day. Nicole got to celebrate her last horse race at the store with a bang (and a spot on the podium, at least), and Emily got to witness her first round of hats and hooves, and all that goes with it. Thanks again go to Rusty and Marie for putting on the festivities, and who knows—maybe Orb will be the first Triple Crown contender we’ve had in a while!